These natural Tibetan incenses are manufactured in Nepal in accordance with ancient text and tradition. Their production provides employment for low income families whilst preserving the age-old incense and paper-making techniques of past generations. Proceeds from incense and journal sales support the preservation and replantation of Lokta in Dolkha and Sindhupaichok, Nepal. The incense rolls are presented in bundles of 19 sticks. They are 14cm long and burn for approximately 45 minutes. They are each wrapped in handcrafted lokta paper. Himalayans consider the Juniper to be a sacred tree. It is used for cleansing during rituals & prayers. Also contains White sandalwood and Cardamom. Excellent for recharging people and spaces with new energy. A delightful Tibetan incense prepared from a blend of Champa flowers, Sandalwood and Magnolia essential oil with a touch of Honey for sweetness. A special blend of Amber Scotch Pine, Sandalwood, Clary Sage and aromatic Himalayan Herbs. This incense has a sweet honey-like aroma. Sandalwood essential oil expertly blended with Frankincense, Cedarwood and aromatic Himalayan Herbs. A special blend of Lotus flowers and seeds ( India 's most sacred plant) with Hibiscus seeds, Sandalwood & Himalayan Herbs have been used to prepare this exquisite incense. This incense is prepared from a blend of Jasmine flowers with Honeysuckle flowers and Sandalwood. Increases the hearts qualities of love & compassion. A Puja offering for purification. 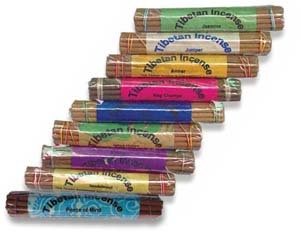 This very special Tibetan incense takes its name from the traditional Tibetan Prayer Flags. Prepared from Red & White Sandalwood, Saffron, Juniper, Mountain Laura, Zimbu and Spikenard. Made in accordance with the ancient Dakkar Taso Monastery Tradition. This herbal incense is traditionally used in Tibetan Buddhist practice for cleansing and purification. Contains White Sandalwood, Nepali Cardamom, Clove, Nutmeg, Cinnamon, Indian Valerian and 15 other Himalayan Herbs. This traditional Tibetan incense blend is used specifically in Tibetan Buddhist Medicine for calming and soothing the mind. It is prepared from Sandalwood, Juniper, Geranium, Vetiver, Patchouli and various Himalayan herbs.